The collision point between books and motion pictures is exciting to me. Since my first book, Mac Slater Coolhunter, was released in 2008 I have been creating trailers and using them in school talks and online to get kids, teens and adults excited about reading. Video is one of the most powerful tools we have for bringing books to life. I’ve just launched a book-trailer-making competition for kids in partnership with Penguin-Random House Australia and Dymocks Children’s Charities. I’d love you to enter so, in this post, I will share what I have learnt while making my own trailers for Mac Slater, the My Life series and Two Wolves as well as a few trailers that I love from other authors and students. I’ll also give my top five book trailer-making tips. I have made very simple book videos using Creative Commons images, music and voiceover, right through to live-action trailers and 3D animation. To make a good trailer you need to read, think about and understand the book before re-interpreting it in a visual medium. A book trailer is like a movie trailer, but for a book. The aim of the video is to make others want to read the book. Good trailers suggest and tease the tone and content of the book without giving too much away. The best book trailers are simple. An expensive, cinematic trailer can often suggest that it’s a trailer for a film, while a simple trailer can feel more akin to the reading experience, leaving much to the imagination. Book trailers, as a medium, are in their infancy and, often, students are making trailers more professional-looking and effective in communicating their message than authors themselves. I have been involved with LitVids for many years, a book trailer competition in partnership with Mackay Libraries and I have watched hundreds of student-made trailers. Some fall wide of the mark but many have included simple flash or stop-motion animation, moody scenes from the book, readings of key passages and reviews done in highly original ways. Here’s my book trailer for Two Wolves and, below, a highly original student-made trailer for Two Wolves (using handy animation tool Explee) that was a winner in the LitVids book-trailer competition. Before you do anything, watching lots of other video book trailers is useful, working out what works and what doesn’t. Are there trailers with simple ideas and low budgets that make you want to read the book? Think about how each trailer was made. What did they need in order to make that trailer? A camera or did they find still pictures? Did they record audio or is it just music, possibly royalty-free? Did they use actors? A voiceover person? Is it animated? Stop-motion, 2D or 3D? Do you think that you could make a trailer like this? If so, how could this type of trailer be adapted for the book you’re thinking of making a trailer about? Marcel the Shell With Shoes On is simple stop-motion animation with a brilliant script. It was actually a trailer/clip made before the book was commissioned. Wonder is an amazing book and one of my favourite trailers, capturing the tone of the novel and using key lines from the story. By not revealing the main character’s face, it leaves a mystery, an unspoken element, a piece of the puzzle that we need to solve. This is an effective tool in trailer-making. Chloe and the Lion features the creators of the book. It makes us like the author and illustrator, which makes us want to read their work. It might be possible to make a trailer featuring two students arguing over the merits of a particular book. Book trailers need a strong idea. They need to capture the tone of the story. The most basic rule in storytelling is ‘show, don’t tell’. The trailer may not have any words but it should convey the feeling and idea of the book. Don’t try to tell the viewer everything that happens. Leave some things unsaid. Tease the viewer with any mystery elements in the book. Short is good, long is bad in video book trailer-making. The best trailers are 30 seconds to a minute long, two minutes maximum. Perhaps a 15 second trailer for Instagram might be a good challenge. The best trailers drop the viewer into the world of the story and leave them wanting more, needing more. Originality is key. The trailer should be remarkable and shareable so that the viewer wants to show someone else right away. There is no need to spend big money on the making of a trailer. My trailer for My Life & Other Stuff That Went Wrong had a budget of $40 to feed the cast and crew and to purchase ingredients for a large bucket of slime that a group of children poured on my head. I recommend using available resources. If you have friends who love to act, ask them to be in it. If you are a keen photographer, perhaps the trailer is a series of evocative stills or you might want to try your hand at cinematography. For my 3D-animated Nit Boy trailer, a family member and new-found friend Peter Leary did the animation and a talented friend made the music. The Two Wolves trailer is a TV news story about two missing children and my sister, a newsreader, read the story for me after recording the news one night. 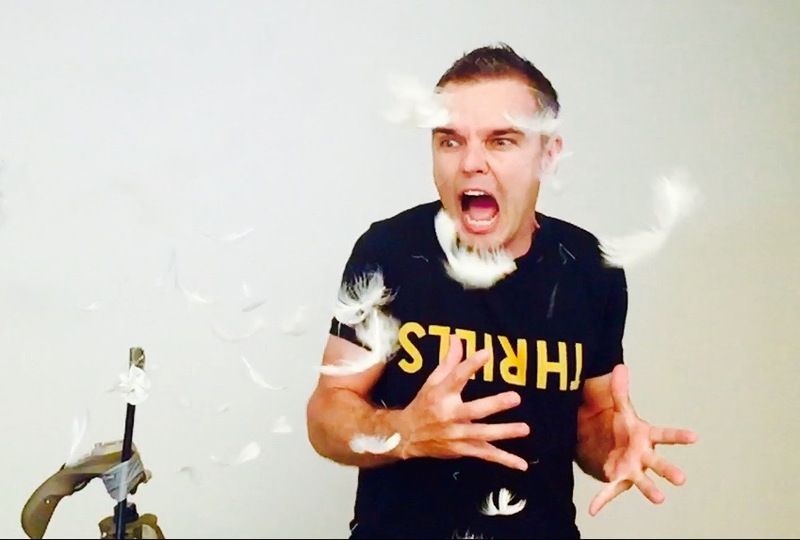 The My life & Other Exploding Chickens trailer at top of this post features me, a white wall, a rubber glove painted like a chicken and some hand-written cards. Think simple. I always recommend writing a script for a trailer. It can be rough at first. Take 10 to 15 minutes to freewrite your ideas on the book and how it might be brought to life with video. Try to write non-stop for the entire time in order to tap your unconscious ideas about the book. Leave the freewrite alone for an hour or a day and, when you read it back later, write a rough first draft script. Again, take some time away and come back to it, shaping it into a screenplay that makes sense. Then give it a fourth pass, polishing and starting to think about what needs to be gathered for the creation of the trailer. 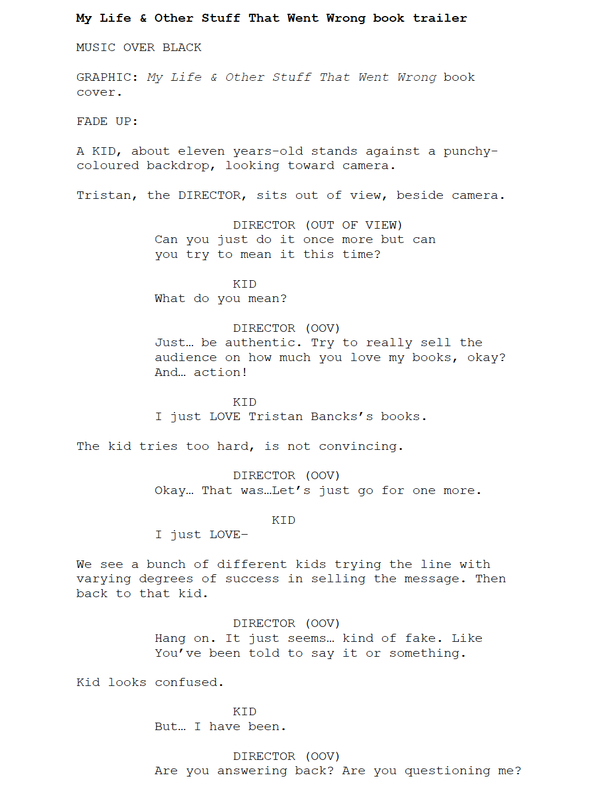 Here’s two pages from the script for the My Life & Other Stuff That Went Wrong trailer. Read it and then look at the trailer later in this post. How closely did we keep to the script? They say a film or video is written three times – once at script stage, once while shooting and again in the edit. While writing the script, pre-visualising the trailer can be useful, gathering images, video and music that spark ideas. I have developed a free transmedia brainstorming tool called Story Scrapbook with my friend Ben Train from Mad Egg. It’s for Mac and PC (not so much iPads) and allows images, video, music and maps to be gathered together on a virtual scrapbook page. Perfect for when the ideas aren’t flowing and for students who think visually and aurally, rather than textually. Show the trailer script to people, get feedback and if they don’t seem genuinely intrigued, keep refining the script. The trailer should be at least as entertaining, funny, gripping or moving as the book. The greatest challenge of the video book trailer is that there is no existing footage. A movie trailer can be created from the content already recorded. Not so with a book trailer. Images or video must be found or shot and copyright must be respected. If the book features illustrations, perhaps they could be used in the trailer. I have never heard of an illustrator protesting student use of their illustrations to advertise their own book. 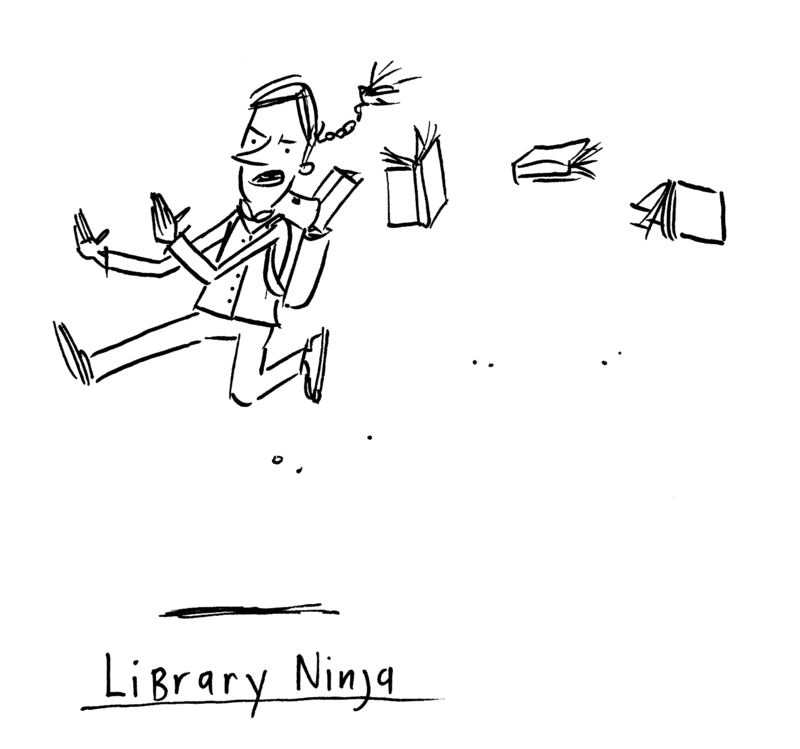 One of Gus Gordon’s fun illustrations for My Life & Other Exploding Chickens. Equipment for trailer-making can be as simple as an iPod, iPad or iPhone, shooting, editing and sharing on one device. My earliest trailers for the Mac Slater books were a series of fast-cut royalty-free stills edited together on iMovie, a free program on the Mac (Windows Moviemaker is the PC equivalent) with royalty-free music and my own voiceover. Creative Commons and royalty-free stills can be found via a Google Image search but my favourite sources of free images are free photo libraries like Boss Fight. The image quality and resolution is very high and browsing through high-quality images can spark fresh ideas for the trailer. One of the stars of the My Life & Other Stuff That Went Wrong book trailer below. If you are shooting a trailer rather than using existing stills, think about sound and lighting. Will you use an external microphone plugged into the camera or iPad? If so, try to monitor the audio levels with headphones. Will you use available, natural light or do you have access to lights that will help even out the shadows on your actors’ faces? Do you have a shooting location in mind? Visit the location and think about any sound or light issues at the time of day you plan to shoot. And check the weather report. Shooting indoors allows much greater control over these elements than shooting outdoors or on location. If planning to shoot footage, a tight storyboard is required (free storyboard templates are downloadable). Do several drafts of the storyboard in the same way that the script has been through several drafts. Try to see the entire trailer from fade-in to fade-out in your mind’s eye before you roll camera. There is no point in making a trailer unless it is seen by other humans. Upload it to YouTube, TeacherTube, Instagram or Vimeo, share word on it and ask people to Like the trailer if they enjoy it. Screen it at assembly, in class and in the library. Look up book trailer-making competitions and enter them. 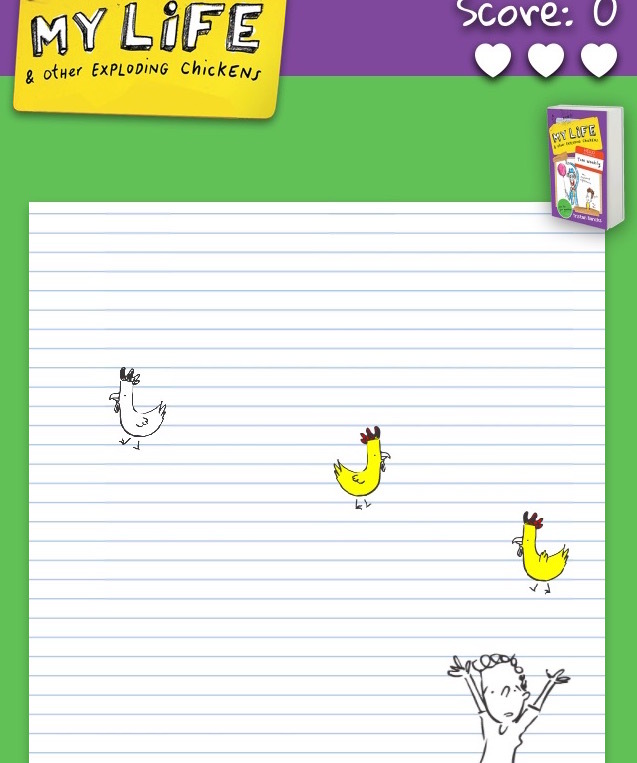 The details for my new Exploding Chickens book trailer competition are here. Most of all, have fun creating a video about a story that you love. Book trailers are a simple movie-making exercise and an enjoyable way to think about, adapt and share books with others. Please feel free to enter the competition or share your efforts with me at contact@tristanbancks.com. I would love to know how you get along. Good luck! 1. Choose a book you’ve written or one that you really love. Your trailer is a tool to get other people excited to pick up a book. 2. Write a 30-second to one-minute trailer script. Two minutes max! Remember: Short is good. Long is bad. 3. Pre-visualise your trailer, gathering images, music and other videos for ideas. Try using Story Scrapbook, my free transmedia story brainstorming tool. 5. Share it widely online and submit it to book trailer-making competitions and screen it live if you have a chance to speak in front of a class or another audience. Some of the ideas in this post were shared with Sydney Writer’s Centre in this interview, ‘Anatomy of a Book Trailer’. A version of this complete article is in the current issue of ALEA journal, Literacy Learning : The Middle Years. Yes, thanks for this. I’ll be doing my trailer before the end of April and will check out these programs. Thanks. Great stuff, Reine. Have you submitted your trailer? Cheers! Tristan.